Buyers and sellers can easily become confused between the various different house price surveys reproduced in the media, which often appear to conflict with each other. Thankfully, your local independent Guild estate agent, Lesters have the necessary specialist knowledge to interpret this and provide you with expert guidance. Lesters have sophisticated tools that can provide you with weekly updates on the latest developments on your property (by location, price, even number of bedrooms) – and turn this into an intelligent and compelling buying or selling strategy. So in what is a ‘sea of information’, try not to be overwhelmed and take time to understand the truth and relevance behind the numbers. Most importantly, always seek a local expert agent as a guide. Their advice is normally free and could be worth literally tens of thousands of pounds. So how do house price surveys work, and which ones should you trust? The Land Registry, which records all completed property sales in England and Wales has been recording the price of all property sales since April 2000, although the data now goes back to January 1995. The monthly survey tracks the end of the buying process, when a transaction is registered. It uses something called Repeat Sales Regression to measure the change in prices over time. This means it only records the change in the price of properties that have been sold before, to ensure a proper comparison. Most sales are included, except for commercial properties and a small number of residential sales, such as those of council houses and council flats sold at a discount. Also, repossessions and property transfers following a divorce are excluded to avoid skewing the sample. The proceeds of all the transactions are added up, and then divided by the total number of sales to reach an average sale price. As it takes virtually all residential property sales into account, the Land Registry`s figures can provide a unique insight down to postcode level. Next, the Government has its own monthly house price index, issued by the Department for Communities and Local Government (DCLG). This covers the whole of the UK and is based on data supplied by the Council of Mortgage Lenders. It is produced using a large sample (approximately 60%) of completed sales all of which have a mortgage attached, but cash sales are not included. Unlike the Nationwide and Halifax surveys (see below) which are weighted according to transactions, the DLG survey depends much more on the total amount of money spent. This means that London and the South East, where house prices are highest, will have a greater influence on the Government`s index. Perhaps the best known reports on the property market are provided by two of the UK`s biggest mortgage lenders – the Halifax and the Nationwide. Both surveys cover the entire UK, but are based on a sample of each lender`s own loans each month. The prices measured are those agreed at the point when the mortgage is approved, not at the later point when the sale is completed. The two surveys use identical statistical methods but because they use different samples, the figures sometimes diverge, in terms of both the monthly price changes and annual trends. Also, like the DCLG survey, they are based only on property sales financed by mortgage lending, ignoring sales which are transacted on a cash basis. As a contrast, the RICS survey reflects confidence in the property market rather than what is actually happening to house prices. About 250 estate agents in the UK who are members are asked if they feel prices in their own areas have been rising or falling in the preceding three months. Although this appears to be a rather narrow and subjective way of measuring property price changes, generally speaking the RICS survey is the first to show any major changes in the market. Finally, Hometrack and Rightmove are two property industry businesses which also produce their own house price surveys. Started in 1999, Hometrack collects data from 3,500 estate agent offices from all 2,200 postcode districts in England and Wales. 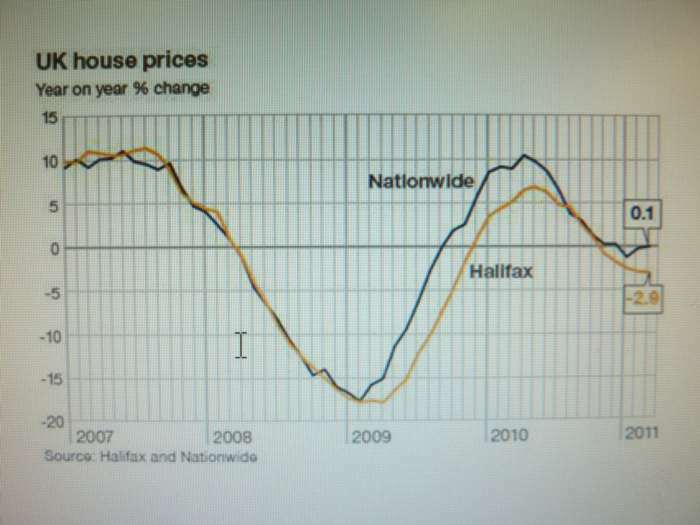 The estate agents report whether asking prices are rising or falling. They are asked to report the "achievable selling price" for each of four standard property types in their area. Rightmove`s survey operates in a completely different way, by collating asking prices for houses placed on its own website over the previous month. The firm says its website now displays 90% of all homes for sale in the UK although its monthly survey covers just England and Wales. However, it obviously does not reflect the prices at which properties actually sell.